For the American actor of the same name, see Gareth Williams (actor). Gareth Wyn Williams, Baron Williams of Mostyn, PC, QC, (5 February 1941 – 20 September 2003) was a Welsh barrister and Labour politician who was Leader of the House of Lords, Lord President of the Council and a member of the Cabinet at the time of his sudden death in 2003. He had a successful legal career, becoming a Queen's Counsel, Recorder, Deputy High Court Judge and Chairman of the Bar Council. 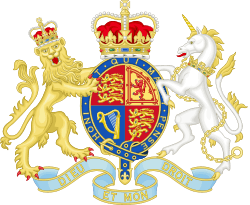 He was created a life peer on 20 July 1992 as Baron Williams of Mostyn, of Great Tew in the County of Oxfordshire and became an opposition spokesman in the House of Lords on Legal Affairs, and later Northern Ireland. After Labour's election victory he appointed a Home Office minister, and in 1999 became Attorney General for England and Wales and Northern Ireland. He was appointed Leader of the House of Lords in 2001, initially with the sinecure office of Lord Privy Seal, for which Lord President of the Council was substituted in 2003. Lord Williams married firstly in 1962 Pauline, daughter of Ernest Clarke, and by her had two daughters, Martha (born 1973) and Emma (born 1976), and a son, Daniel (born 1981). They divorced, and he married secondly in 1994 Veena M Russell, and by her had one daughter, Imogen. ↑ The London Gazette: no. 53009. p. 13149. 4 August 1992. ↑ Mullin, Chris (2009). "Monday 7 January 2002". A View from the Foothills: The Diaries of Chris Mullin. Profile Books. p. 248. ISBN 978-1-84668-230-8.